Students from Easton Area High School are talking about more than just Monday's first day of class; they're talking about a quote by Adolf Hitler from the 2010 yearbook. "It is in fact a quote from Hitler and it was selected from numerous quotes and various sources," Easton Area High School Principal Michael Koch said. The quote reads: "And in the last analysis, success is what matters." Koch says printing the quote in the yearbook was a mistake and oversight by the administration. Koch says someone from a local newspaper notified him about the quote earlier this week. "We will have closer revisions next time to ensure nothing like this happens again," said Koch. 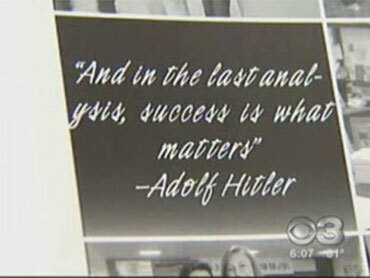 When CBS 3 Eyewitness News asked students and parents how they felt about the error, many said they don't think the quote was posted with malicious intent. "I think considering the size of the school, mistakes happen and it could bypass people," said parent Linda Leichliter. "I mean I don't know why they'd put it in there," said 12th grade student Audreana Fennell. "I'm sure they didn't mean it in a bad way. Easton Area High is a school of about 3,100 students, grades 9th-12th. Koch admits that in 2003, a racial slur made its way into the yearbook, but he says, he wasn't the principal at the time.